In a medium sized bowl, gently stir the first 9 ingredients. Set aside. In a small bowl, whisk together the white balsamic vinegar, lemon juice and honey. Whisk until the honey dissolves. Stir in the vinegar, lemon juice and honey into the bowl with the mortadella mixture. Fold in the Dijon mustard, mayonnaise, and olive oil. Taste the tartar, it may need a bit more mustard or salt and pepper depending on saltiness of other ingredients. 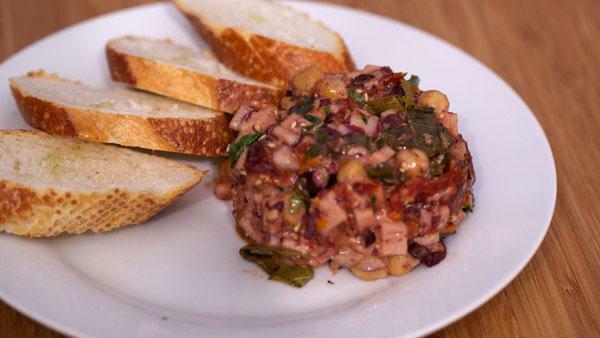 When ready to serve the tartare you can spoon it into a small decorative bowl and surround it with sliced bread and saltines. If you want to fancy it up a little bit, scoop the tartare mixture into the "bowl" of an 8 oz measuring cup and pack it in nice and tight, allowing it into a cylindrical shape. Tip the cup onto your serving plate and slide the measuring cup right off. Decorate the tartare with a few more sesame seeds and fresh basil, surround with sliced bread and crackers. Enjoy!